Going To See... - Ramblings of Mad Shutterbug & the Border Collie Bros.
From a trip to see my sister and brother-in-law in November, 2000. We indulged in a bit of nepotism, since sister organised a seminar on 'Technology in Nursing' for the School of Nursing there, and I submitted an abstract which she accepted. Couldn't pay travel costs, could provide free room and board. Plus, got to see George and the Boys for the first time this trip. After showing me Mt. 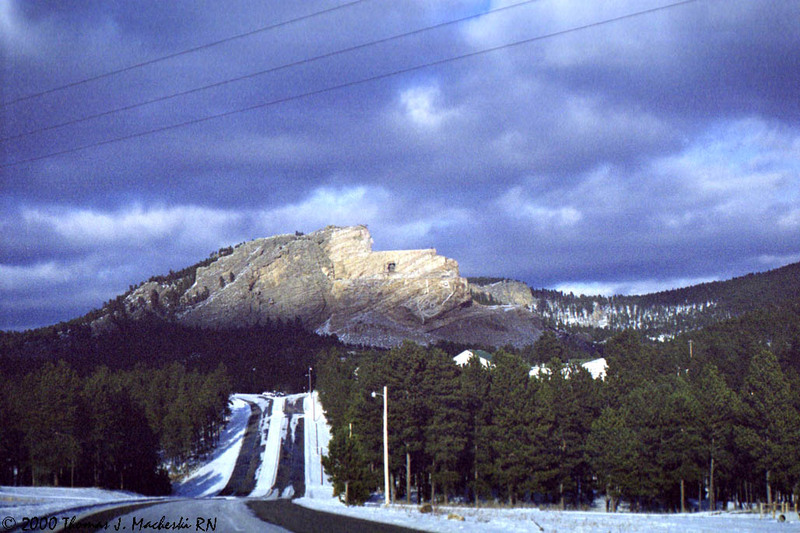 Rushmore, brother-in-law took me to see the Crazy Horse Memorial, a work in progress. Do your own search for information on this, it is well worth the learning. This trip also turned up the first signs that the Nikon EM 35mm SLR I'd inherited from a friend would die soon as well. Most probably the cold edged the early signs, but the cause was a lot of use. This photo is not one of the early signs, however.